This month, U.S. District Judge Richard Leon approved AT&T’s (NYSE: T) $85 billion buyout of Time Warner. The Department of Justice (DOJ) didn’t seek a stay on the judgement, and AT&T finalized the deal shortly. The lack of follow up from the DOJ will embolden a market rich in cash and on the verge of losing access to easy money. But not all mega mergers are created equal. I said back in October that the Time Warner acquisition would do little to help AT&T. Netflix’s growth has already outstripped what little benefit Time Warner would provide. And AT&T will take a major hit to its bottom line due to the cost of the buyout. Including Time Warner’s obligations, AT&T’s debt now stands at more than $187 billion. Naturally, the first company through the floodgates was Comcast Corp. (Nasdaq: CMCSA). Comcast had long said that it would make another bid for 21st Century Fox (Nasdaq: FOX) after Walt Disney (NYSE: DIS) outbid the company earlier this year. The company was using the AT&T case as a litmus test. If AT&T won, Comcast would go all in to acquire Fox’s holding. One day after the AT&T ruling, it upped its bid for Fox properties to $65 billion, topping Disney’s $52.4 billion offer. Comcast stock rallied on the news, as investor sentiment cheered the potential acquisition. As I noted in October, AT&T is in trouble even after the Time Warner acquisition. But Comcast is going to be in even worse shape. AT&T has a profitable wireless division and online streaming service it can use to leverage new content. Comcast has nothing of the sort. In other words, it’s taking on massive debt to acquire content it has no cost-effective means of getting to subscribers … and that means big trouble for the stock. Comcast’s main content distribution channel is still tied to traditional cable TV subscriptions. Those traditional subscriptions are dying. A year ago, I proclaimed that the death of cable TV was only a few years away, with Comcast struggling to make up for hemorrhaging cable subscribers with high-speed internet subs. Those new internet subs don’t bring in the same amount of money as high-dollar cable TV packages. And Comcast has been slow to adapt to the new paradigm of online TV offerings (i.e. Netflix, Hulu, and Amazon Prime TV). With NBC Universal already in Comcast’s wheelhouse, it’s clear that content is not the company’s problem, it’s delivery. In other words, the acquisition of 21st Century Fox properties addresses the wrong problem for Comcast. It has content. While more content could arguably be better, delivery has always been the company’s biggest concern, and biggest cost. With the $65 billion bid for Fox, Comcast is ignoring cable TV losses. Those subscribers aren’t coming back no matter how much content the company adds. On top of that, it’s adding a massive amount of debt. In its bid for Fox, Comcast has pledged $65 billion, all in cash. It says this makes its deal superior to Disney’s, which is an all stock deal. However, assuming it finances the deal with debt, Comcast’s total outstanding corporate debt would rise to $174.9 billion. 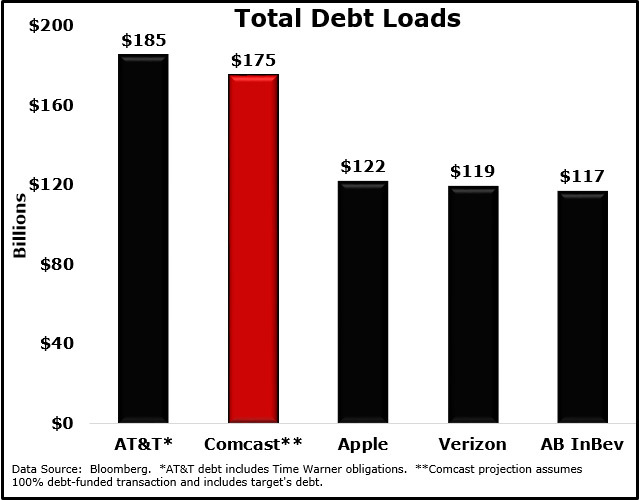 That’s just shy of AT&T’s massive debt load, putting Comcast among the most indebted U.S. companies. And it’s doing so amid an aggressive push by the Federal Reserve to raise interest rates. That debt is going to get increasingly expensive, all while Comcast is struggling to hold on to cable TV subscribers and ignoring the online streaming revolution. So is now the time to invest in Comcast stock?